Less than a week ago, I logged on to Ancestry to find a newly added database entitled Web: Tennessee, Relocated Cemeteries Index, 1787-1975. In case you were not aware, an Ancestry database that is prefaced with the word "Web" is usually readily accessible on the internet without a subscription. While the convenience of searching through Ancestry is nice, since I'm already a subscriber, I went directly to the source and gave it a browse. After all, I was not even aware it existed online! To carry out its mission in the Tennessee Valley, TVA had to alter the landscape. The agency’s major construction projects required relocating roads and utility lines, as well as inundating many acres of countryside. As an extension of these construction projects, TVA undertook the difficult and delicate task of relocating thousands of graves. Surveys were conducted of all cemeteries in the project areas. Beginning in 1933, more than 69,000 graves were investigated, and over 20,000 graves were relocated. TVA moved the graves from areas that were to be flooded and from isolated sites to comparable burial places nearby. The removal was done in accordance with state law and the wishes of the next of kin. In addition to relocating the graves, TVA cleaned, repaired, and reset monuments and headstones at the reinterment sites. Entries in the database which can be viewed in PDF or Excel format provide first and last names, birth and death dates, project name, state and county, original cemetery and grave number, year the grave was relocated, and new cemetery name, number, and grave number. Silas' remains were relocated about eleven years after his death in 1923 and original burial in Bakers Forge Cemetery. The new site selected is in Demory, Campbell County, TN and named Bakers Forge Memorial Cemetery. "Norris Dam is a hydroelectric and flood control structure located on the Clinch River in Anderson County and Campbell County, Tennessee, USA. 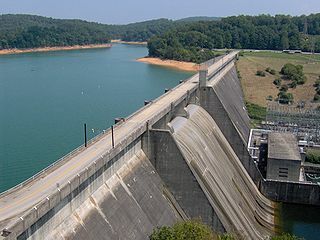 Its construction in the mid-1930s was the first major project for the Tennessee Valley Authority, which had been created in 1933 to bring economic development to the region and control the rampant flooding that had long plagued the Tennessee Valley...The building of Norris Dam and its accompanying reservoir required the purchase of over 152,000 acres (62,000 ha) of land. 2,841 families and 5,226 graves were relocated. The community of Loyston, located about 20 miles (32 km) upstream from the dam site, was entirely inundated. Approximately one-third of Caryville, at the head of the reservoir's Cove Creek embayment, was flooded and a number of structures in the town had to be moved." I'm compelled to mention that one should not assume Tennessee is the only state represented in this database. You can also find projects and relocations that effected Alabama, Georgia, Kentucky, and North Carolina (and that's just viewing the surnames beginning with the letter A).